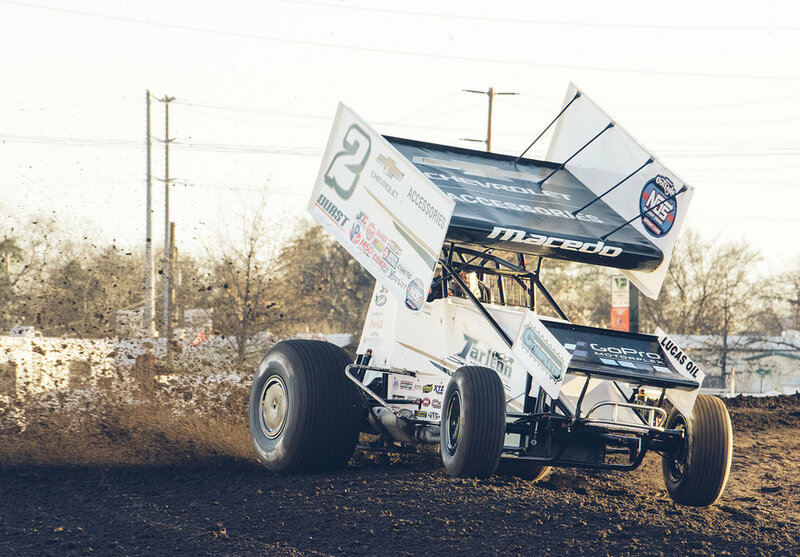 Macedo on the gas at Chico, 2019. 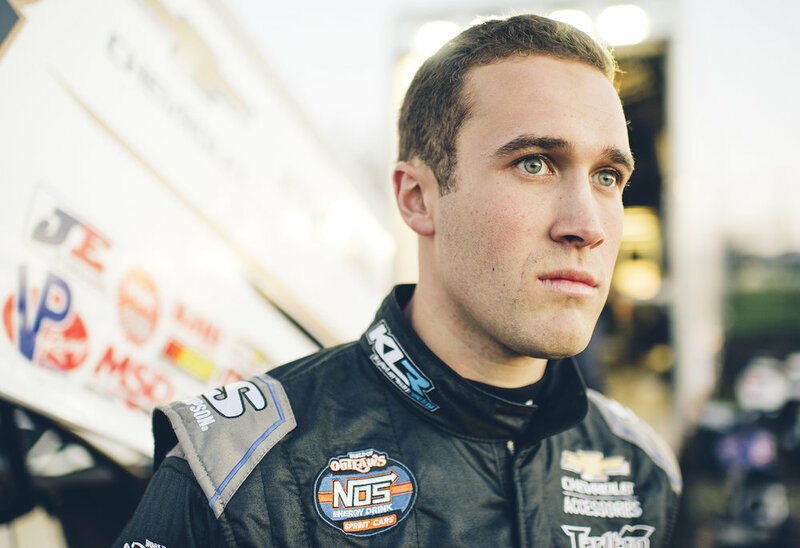 Spotlight | Carson Macedo is back on his home turf in Northern California and it’s the fourth race of an eight-night run through the Golden State for the World of Outlaws. Tonight at the Stockton Dirt Track, the Lemoore, CA, native is coming back from a thrilling victory at the annual Mini Gold Cup at Silver Dollar Speedway in Chico. Macedo came from a seventh-place starting position and passed some of the best in the game during the 35-lap main event on the storied quarter-mile dirt track. He took the lead from veteran Brad Sweet on lap 20 and never looked back. It was Macedo’s second Outlaw victory and second at Chico, the place where he claimed his breakthrough and only other Outlaw victory in 2014. After winning the first night of the 2014 Gold Cup at Chico, 18-year-old Macedo celebrates his first Outlaw series victory. 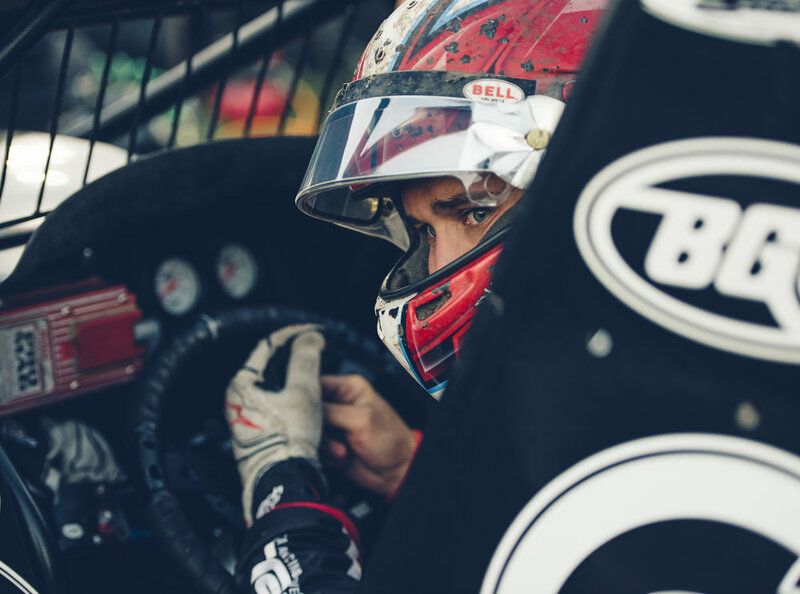 In his first year driving for Kyle Larson Racing, a top-tier winged sprint car team, Macedo will compete on the entire 92-race World of Outlaws schedule in 2019. At 22, he’s the youngest driver on the national tour and the lone rookie. 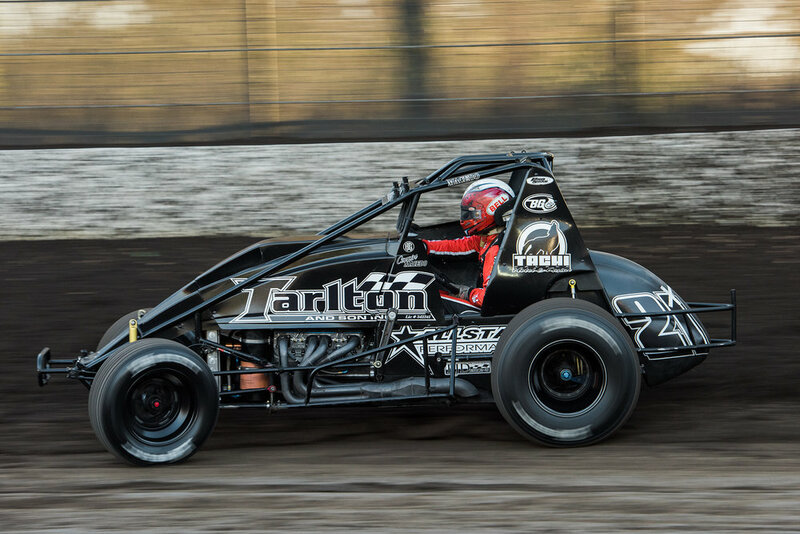 Team owner Larson, originally from Elk Grove, CA, is also a California-bred sprint car racer, and a longtime friend. At 26, Larson is a high-caliber talent on the premier NASCAR Cup Series. Like Larson, Macedo grew up racing sprint cars on the dirt bullrings of the state. With the good fortune that Larson has earned from his climb to NASCAR’s premier series, the young star is spreading good karma back to his roots, supporting talent from his home state. Macedo is a fourth-generation racer and cut his racing teeth driving micro sprints in Lemoore and Visalia. He first raced a sprint car at age 15. 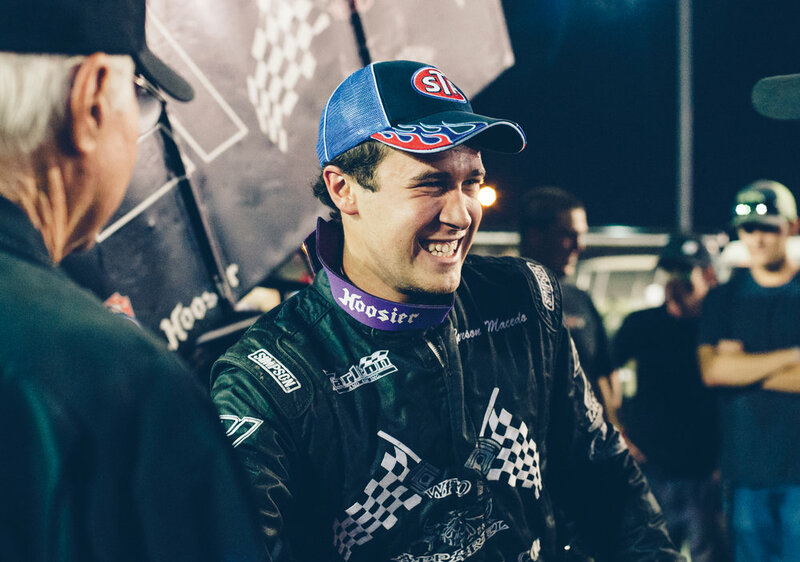 After winning California’s King of the West 410 sprint car championship in 2015, he focused on racing in the Midwest, where he continued to hone his dirt open-wheel driving skills, winning the 2016 USAC National Midget Rookie award and numerous sprint car and midget main events. How does last night’s win compare to your first win in ’14? Macedo: It’s a little different, because it’s my first full year on the series. Last night was a little bit more of an earned win, I think, because, you know, don’t get me wrong, I feel like I earned the one in 2014, but I started on the front row that night and I got by Daryn [Pittman], but that was the only pass I had to make. Last night, to come from seventh in an Outlaw show these days is not easy, so it was a cool race. Big win. Wheeling the Tarlton wingless sprint during Calistoga’s 2016 Vermeil Classic. You made some strong moves to get up to the front. Macedo: Yeah, I was able to make my way up through there. I could bide my time, [I was] patient and I kinda let things play out. The track was super technical. There was a lot of mayhem. For me, it was waiting and being patiently aggressive. I made the moves when I needed to and at the same time, I didn’t take myself out of contention. Did your experience at Chico come into play? Macedo: I think it did. It seems like that place has characteristics that are pretty even every time we go there. Usually you get that rough top, which has to be that way in order for the bottom to keep up, but if you can run it right, you can really make speed up there and I was able to do that. How has it been working with Kyle as a car owner? Macedo: It’s been pretty cool. Not many opportunities come up like this one for a young guy like myself. I’m only 22. I’m the youngest guy out here on the Outlaw tour. Not very many car owners give somebody this young an opportunity to be out here. They want a guy that’s been out here and proven and won a bunch of races. It’s just cool for Kyle to give a young guy a shot. It says a lot about his character. Did he give you a call last night after the win? Macedo: Yeah, he shot me a text, and said, ‘Great job…’ He watches everything, and he should. Macedo: Not a whole lot. We have to race again tonight. So we will celebrate this week. We had a lot of fun and we can go into tonight with a good attitude. Has Kyle been a mentor as you get going in the season? Macedo: Yeah, he’s been good. He’s an awesome car owner; he just wants you to go out there and give it 100 percent. He doesn’t ask for much more than that. He doesn’t want me to worry about the points this year; he just wants me to run as hard as I can every night. It’s pretty cool, because I like to do that. What’s been your most memorable experience so far this year? Macedo: Last night. You know, you get a win like that, it’s pretty cool. But just this whole journey of being able to drive this car. We’ve had a lot of speed and we’ve been able to qualify really well. We just got to continue to do that and do our best to deal with the bad nights and good nights. … kind of a dream come true for a young sprint car driver. Macedo: Yeah, it’s a dream come true, really. This whole deal. I’m happy to be in this spot, to have good people around me. We just have a really good team right now; everybody’s getting along great, and on the same page. You seemed to have gained an edge when you went to the Midwest to race in 2016. Macedo: Yeah, racing in the Midwest is huge because so many car owners get to see you. You get to go to so many different race tracks and it makes you versatile. In order to be on the Outlaw tour, you have to be good everywhere, so, it gave me the opportunity to go to a lot of the race tracks that I will now go to as a full time Outlaw. And I got to work with a lot of good people. I got to work with Keith Kunz [USAC midget team owner]. In the last two years, I got to drive for Joe Gaerte [crew chief]. He’s working with us and that’s awesome. Racing in the Midwest just puts you on that next level. Tell me about your crew chief, Joe Gaerte. Macedo: He drove for himself for a long time, ran third in the Outlaw points a couple times [1990, ’91]. He’s been a crew chief for the last 15-20 years. He’s very good at it. One of the best, I think. We’re lucky to have him, really lucky to have him. He worked with Daryn Pittman in ’01, ’02 and he’s run his dad’s engine business [Gaerte Engines] for the last few years. He also had Shane Stewart driving for him in his 3G car. James McFadden drove for him a little bit. I drove for him for the last couple of years. He worked on his own stuff and then recently, he sold it all and became crew chief for this team. How has it been adapting to some of the Outlaw tracks that you haven’t been to before? Macedo: It’s just learning. Like Volusia: I’d never been there. It’s all a learning experience. It’s going to make me better as a driver. But sometimes you just have to be willing to go in and say, “OK, I’ve never been here, I’m just going to do the best I can and wherever we end up, we end up and go on to the next track.” You learn and then eventually, when you have been to all those places, then it’s time to step up and start getting those results. This year, I don’t want to say it’s a learning year, because I think we can compete on a high level every night, but I think this year will be a notebook-building year. 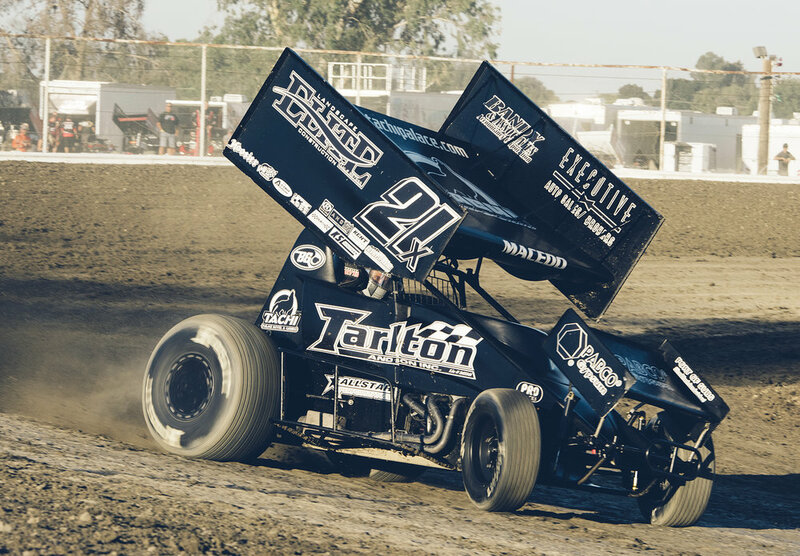 Driving the Tarlton 21x, here at Hanford, California, Macedo claimed the 2015 King of the West title for 410 sprint cars. Macedo: Kinda all over the place. When I’m in California, I sorta just stay with my family. When I’m in the Indiana area, Joe [Gaerte] has a shop that we use and there’s a little apartment built inside of the shop. I can stay there. Or, if we’re in the North Carolina area, Kyle’s got some living quarters built in the shop. So it just depends on where we’re at. It’s hard to have a permanent location when you’re on the road as much as we are. Do you get homesick for California? Macedo: I do have moments. I like being with my family and friends, but you make family and friends out on the road. It’s been a cool experience during the last few years to move out to the Midwest and meet so many good people and build that [home] environment somewhere else. I miss the racing [in California]. Some of my favorite tracks are out here. Sometimes I miss running them but we come out here with the Outlaws once or twice a year and run a lot of these places. It’s always nice. You just hope the rain stays away. This time of year, it’s always a little sketchy. Tulare is probably my number one favorite track out here. I’ve always been a big fan of Tulare. I just like the characteristics of the tracks out here. They’re little bullrings. They definitely promote aggressive driving. Tell me about your family’s racing history. Macedo: I’m a fourth-generation racer. My grandpa’s the one who started me out racing, Robby Tarlton, which is Tom Tarlton’s brother. Tom put me in a sprint car when I was 15. I was born into it. My mom raced; my dad raced. Both of my grandparents, on both sides, ended up racing. When my mom met my dad, he kinda got into it, and then my grandpa on my dad’s side got into it. Racing was there before I was even born. They all raced micro sprints. Myself and Tommy Tarlton were the first two to run sprint cars. Even on the other side of my family, the Tarlton side, there’s my cousin Mitchell and Michael Facinto: They both race [sprint cars and midgets]. They’ve done a great job in California. My grandpa gave me a start and not too long after that, my dad bought me a car [micro] and I raced for him until I was about 12. From then on, I just drove for other people and Tom picked me up when I was 15. You were racing micros at Lemoore and Visalia mostly, right? And your mom was racing? Macedo: Yeah, she drove for my grandpa for a long time, 12 or 13 years, and then when she had me, gave it all up. You’re a versatile driver; you also race the wingless sprints and midgets. Macedo: I like to do a little bit of everything. I believe, in order to be the best at something, you have to have focus; you can’t constantly be jumping back and forth. But I feel, every once in a while, to have a little bit of fun and go run some non-wing is necessary. We do the Turkey Night every year in Ventura with the Tarlton family, and I usually try to pick up a midget ride. So I think it’s just important to have fun. But in order to master something, you have to focus on it. So my main focus is a winged sprint car.